Sorry about that. Anyway… It’s the one and only J. Marcus Voorhees on this week’s cast! He’s here to spill the beans about his dinners with Mr. K and to express his joys and sorrows over the recent Halloween season. Oh and did you hear about the big news this week? A very special TV show is finally making it to a home theater near you after decades of seclusion! 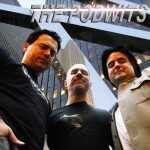 It’s a spooky edition of the Podwits Podcast that you’ll have to hear to believe!